Driving can be extremely dangerous. Even though most car trips are uneventful, the National Highway Traffic Safety Administration reports that in 2015, the latest year for which full data is available, there were nearly 6.3 million crashes reported to the police, more than 32,000 of which were fatal. These statistics highlight how important it is to carry adequate auto insurance, and, given the likelihood of getting into an accident, the more coverage you have, the better. Car insurance can be a little confusing, so let’s break things down. Think about it like this: say you’re driving down the road and run into another car, causing significant damage and injuring the other driver. Liability coverage only protects the people you hit. Collision coverage is different, it would pay for the damage to your own vehicle even though you caused the crash. Comprehensive coverage provides another layer of protection, for example in case the weather damages your car. There are two ways to think about paying for car insurance in the US: the amount it takes to get the minimum level of insurance required by your state (liability coverage), and the amount to get full coverage (liability, collision, and comprehensive). 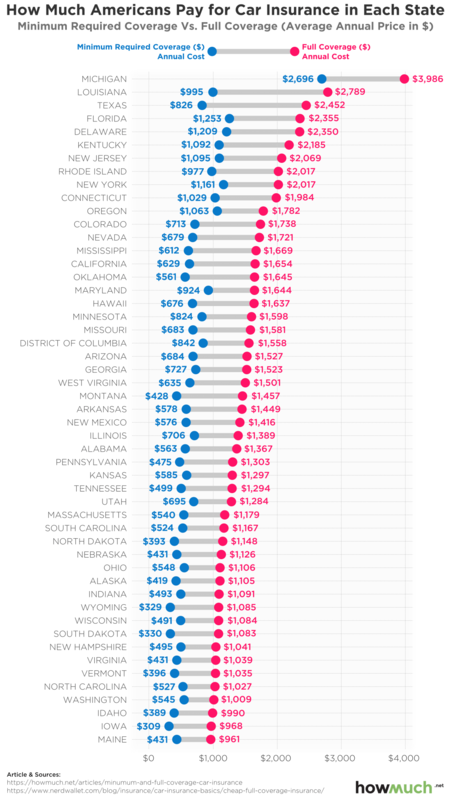 Nerdwallet crunched the numbers behind our latest visualization to find out the average cost of insurance in each state, which we plotted in an intuitive visualization. It turns out that insurance rates vary dramatically by state, even though there isn’t an obvious explanation why. First off, it’s obvious that minimum coverage costs less than full coverage, but there are some states where the difference is relatively small. For example, take a look at North Carolina, where full coverage goes for $1,027 but minimum coverage is only $527, so you’re only saving $500 for a lot less coverage. Compare that to Louisiana, where the difference is $1,794. It seems like insurance companies believe driving in Louisiana is much more dangerous than in North Carolina. And if it doesn’t cost that much more for full coverage, then you may as well get it and protect yourself and your family. There also doesn’t appear to be any obvious geographic explanation for the difference in coverage costs. Michigan stands out as the most expensive state for full coverage at $3,986, not to mention the fact that minimum coverage there is only $100 less than Louisiana’s, next-cheapest, price for full coverage! Perhaps Detroit’s status as the Motor City has something to do with it, but otherwise there is no clear pattern in the distribution. States in the Upper Midwest, Deep South, West Coast, and East Coast all appear at the top of the visualization. Suppose you wanted to pay the least amount of money possible for insurance, and still meet the state-required minimum coverage amounts. Where can the lowest legal rates be found? The absolute cheapest insurance is in Iowa, where it costs only $309 a year (or about $26 each month) for barebones, minimum coverage. That’s so inexpensive that we wonder how much protection a policy like that would provide. Remember, you get what you pay for.